The United States of America entered the 21st century as the world’s sole superpower after the fall of the Soviet Union in late 1991. Certainly a lot of superlatives can be attributed to the U.S.: the third most populous country in the world with 327.7 million people; the largest economy; the most powerful military, among others. The U.S. also has the second largest higher education system (China overtook the U.S. in this regard roughly around 2001), and it is the top destination for globally mobile students. However, despite all these attributes, the U.S. faces many challenges. On the global stage, U.S. hegemony has eroded over the past decade, and China and India are projected to overtake the U.S. in terms of economic output by 2050. The country also remains mired in the war in Afghanistan, the longest running war in its history. Domestically, income inequality is among the worst of the major advanced economies. Furthermore, the bitter 2016 presidential election, in which businessman Donald J. Trump defeated former U.S. Secretary of State Hillary Clinton, exposed deep fissures in American society politically, racially, culturally, and regionally—and has caused some to call into question the strength of American democracy. The U.S. is a large federal republic located in North America between Canada to the north and Mexico, the Gulf of Mexico, and the Caribbean Sea to the south. Federalism is a critical feature of American government and politics. Compared with many countries in Europe, for instance, the U.S. has a weak federal government and lacks a tradition of vigorous government intervention. There are 50 states and one federal district, the District of Columbia or Washington, D.C., home of the nation’s capital. The last two states to be admitted to the Union (a moniker for the union of the states that forms the nation) are separated geographically from the others: Alaska shares a border with Canada and is otherwise surrounded by the Pacific and Arctic Oceans; and the state of Hawaii is composed of a group of islands in the mid-Pacific Ocean. The remaining 48 states, all contiguous, are often collectively called the Continental United States. Additionally, the U.S. has several overseas territories, all located in the Caribbean Sea and the South Pacific Ocean. There are five main inhabited territories: Puerto Rico, the U.S. Virgin Islands, Guam, the Northern Mariana Islands, and American Samoa. (There are numerous largely uninhabited islands that are U.S. territories as well.) The official status of each territory and its relationship with the U.S. varies. In general, however, locals are U.S. citizens—with the exception of American Samoa– and may freely travel to and within the U.S. However, they do not vote in general presidential elections (unless they move to one of the states or Washington, D.C.) and have only nonvoting representation in Congress. All territories have their own territorial governments and exercise a certain degree of autonomy. NOTE: This country profile largely focuses on the 50 states and the District of Columbia, though many descriptions provided also apply to U.S. overseas territories. The U.S. is and, for a long time, has been the top destination of internationally mobile students worldwide. Far fewer U.S. students go abroad for their education – either for a degree or short-term credit – though the number of such students has increased steadily over time. In the 2016/17 academic year, the U.S. hosted 1,078,822 international students, making it, as mentioned earlier, the top host country of globally mobile students worldwide. The country surpassed the one million mark during the previous academic year. International student enrollments over the past decades have soared. There are now twice as many international students in the U.S. than there were in the 1980s: The number of international students increased by 621 percent during the three and a half decades leading up to the 2015/16 school year alone. However, since 2000, the U.S. has been progressively losing market share of students to other countries, both well-established destinations (such as Australia and Germany) and emerging and rising destinations (such as Canada and China). Additionally, the U.S. faces increasing threats to its dominance of the international student market, not least from its own political and cultural climate, as the country is increasingly seen as unwelcoming to immigrants and foreigners. The latest data show that new international enrollments dropped by 3.3 percent in 2016/17 and that the total number of international students slightly decreased between 2017 and 2018. The U.S. receives students from all over the world, but China and India particularly dominate the market, according to data from the Institute of International Education’s recent Open Doors Report. Together, the two countries send about half of all the international students that are in the U.S.; Chinese students alone account for about one-third of all international students, as of 2016/17. South Korea has been the third-largest sending country consistently since the beginning of the 2000s, but its numbers have been declining steadily for years. Saudi Arabia and Canada round out the list of the top five sending countries. The U.S. has long been the top destination for Canadian students seeking degrees abroad. Most international students in the U.S. are degree-seeking students, as opposed to short-term exchange students. Historically, graduate students outnumbered undergraduate students. Now, however, undergraduates make up the largest segment of international students, thanks in large part to the rise of Chinese undergraduates. In 2016/17, there were 439,019 undergraduates and 391,124 graduate students, according to Open Doors. In addition, there were 72,984 non-degree students, including short-term exchange students and students in intensive English programs (IEPs). IEPs have long been a draw among international students who wish to improve their English language skills, usually for access to further education in the U.S. However, the number of international students enrolled in IEPs has been declining sharply. Among the top 10 countries of origin in IEPs in 2016, only Mexico (the fifth-largest sending country to IEPs) increased in number, while all others decreased. In particular, Saudi Arabia and Brazil—the fourth- and sixth-largest senders, respectively—dropped the most from 2015 to 2016, by about 45 percent and 56 percent, respectively. The drop from these two countries can mostly be attributed to major changes to large-scale government scholarship programs in both countries. The reputation and diversity of its higher education system, along with opportunities to work in the country, are among the top reasons that students are drawn to the U.S. A WES report from October 2016, Improving the International Student Experience, found the “availability of a desired program” to be the most important draw to the U.S. overall, with 59 percent of survey respondents citing it as their top reason. However, students from different countries or regions of origin cite different priorities. Chinese students, for example, are more attuned to reputation—of both the overall higher education system and of specific institutions. Reputation is frequently measured through international university rankings (such as the Times Higher Education (THE) World University Ranking). This has been a consistent finding of WES research. The dominance of the U.S. among host nations of international students, however, is slowly eroding. As mentioned, the U.S. has gradually lost market share, even as absolute growth has continued. Other nations are catching up, often with the aid of proactive government-led strategies, increasingly offering high-quality education programs in English and very often at a substantially lower cost. The current political climate in the U.S. has likely had an impact and will continue to, particularly under the administration of President Trump. In numerous forums, U.S. institutions are beginning to report declines in both applications and enrollments of international students. The anti-immigrant rhetoric coming from the White House and other parts of society, along with the denigration of certain groups of people such as Mexicans and Muslims, may scare away some students. Additionally, there are reports of increases in denials and delays in the issuance of U.S. student visas. 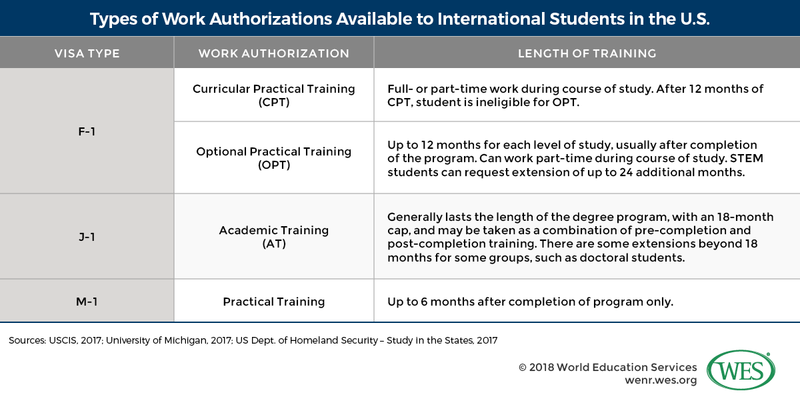 Proposed changes to U.S. immigration policies, including allowing international students to stay and work in the U.S. after graduation, may also pose problems for recruitment. Furthermore, some students are sensitive to issues of safety, real or perceived. Mass shootings and the protracted debate on gun violence in the U.S. often garner international attention, as do hate crimes aimed at certain groups. For example, the shooting of two Indian nationals in a bar in Kansas in 2017 gained media attention in India, possibly causing some Indian students and parents to reconsider applying to U.S. institutions. International student regulations have become more complex within the last two decades. Following the September 11, 2001, terrorist attacks, the U.S. government implemented a stricter set of regulations and oversight to manage international students, chiefly because some of the terrorists were in the U.S. on student visas, largely to attend flight schools. These changes resulted in the Student and Exchange Visitor Program (SEVP) and its corresponding database system known as SEVIS (Student and Exchange Visitor Information System), which are under the auspices of the U.S. Department of Homeland Security (DHS) and one of its main agencies, U.S. Customs and Immigration Service (USCIS). To receive international students, U.S. institutions must be enrolled in SEVP. To become SEVP-certified, institutions must submit a quantity of paperwork and then DHS must do a site visit. Once certified, they may enroll students under specific visa programs. F-1 visas: Generally for full fee-paying students seeking to undertake academic studies in the U.S. This is the most common visa type for students attending U.S. universities and colleges. M-1 visas: Generally for full-time fee-paying students in vocational programs in the U.S., attending a vocational, technical, or trade institute. J-1 visas: An exchange visitor visa. This visa program encompasses a wide variety of students and others, including short-term exchange students (to earn credit at their home institutions), or under certain U.S. or foreign government scholarship programs, whether for degrees or short-term exchange. One of the most famous programs covered by the J-1 visa is the Fulbright Program, a U.S. government scholarship program for foreign students. The J-1 visa program also differs from the others in that it is largely managed by the U.S. Department of State (the U.S. equivalent of the ministry of foreign affairs), though institutions still use SEVIS to track students. Dependents (spouses and children) accompanying the student travel under a corresponding visa with the number 2—that is, F-2, M-2, or J-2. Students from Canada and Bermuda do not need visas, though they need corresponding student paperwork (described below). To obtain a visa, admitted students are issued official forms from their admitting institution and are required to present this paperwork at the respective U.S. embassy or consulate for their visa interview. Students must present this paperwork to immigration officials when they arrive at a port of entry in the U.S. (airport, seaport, or border crossing.) The form issued to F-1 and M-1 visa students is known as a Form I-20, “Certificate of Eligibility for Nonimmigrant Student Status”. J-1 students receive Form DS-2019, “Certificate of Eligibility for Exchange Visitor (J-1) Status.” Institutions issue the respective forms using the SEVIS system. In the vast majority of cases, international students must be enrolled full time, except during summer and other school breaks. As stated earlier, international students have limited opportunities to work during and after their studies. These opportunities are generically known, respectively, as pre-completion work training and post-completion work training. The amount of time that they are allowed to work depends on their visa type, field of study, and, for J-1 visa holders, the level of study. Students can generally work at any time on campus for up to 20 hours a week during the school year and take on more hours during school breaks. When and where they work off-campus varies, though most are not allowed to work during the first year of their program. There are limited opportunities for students to stay in the U.S. after completing their allowed post-completion work training. The most popular route is the H-1B visa, a temporary work visa for skilled workers that is valid for six years. Afterwards employers can sponsor H-1 visa holders for permanent residency, but the Trump administration is trying to make this process more difficult, and it remains to be seen what potential future changes in immigration policies could affect the H1-B visa. The number of outbound students—U.S. nationals who go abroad for education—is substantially smaller than the number of inbound students. According to the UNESCO Institute of Statistics (UIS), the outbound mobility ratio, that is, the percentage of students studying abroad out of the total postsecondary population of the country, is only 0.3, whereas the inbound mobility ratio is 4.7. UNESCO’s numbers, however, reflect only degree-seeking students, not short-term exchange students, often called “study abroad” students in the United States. In general, much more is known about such students because their participation is much easier to track, as IIE’s Open Doors Report does via participating U.S. higher education institutions. It’s much more difficult to track degree-seeking students abroad with as much certainty. That being said, UNESCO reports that the number of degree-seeking U.S. students abroad stood at 68,580 in 2017—an increase of 56.7 percent over the year 2000, when there were 43,756 U.S. degree-seeking students enrolled abroad. The most popular destination among this group, by far, is the United Kingdom, at 15,378. The U.S. is the sixth top country of origin of international students in the UK. The next-largest number of U.S. students goes to Canada, with 8,355 students. The third top destination, according to UNESCO, is the Caribbean island nation of Grenada, with 4,543 American students. A large number of American (and Canadian) students attend mostly for-profit medical schools in several English-speaking Caribbean nations, including Grenada, Barbados, and Dominica. These institutions will often take students who were not admitted to U.S. medical schools but who hope to obtain a residency position back in the U.S. once done. The next few top destinations for U.S. degree-seekers are mostly Western European, like Germany and France, or major English-speaking countries, like Australia. According to an IIE report from 2013, roughly the same number of bachelor’s-level and master’s-level U.S. degree-seekers pursue their degrees abroad. In the 2011/12 academic year, there were about 42 percent each studying toward one of these degrees, plus another 16 percent enrolled at the doctoral level. There were, of course, important differences among destination countries. For example, graduate students (master’s and doctoral levels) outnumbered undergraduates in the UK, while more than 80 percent of U.S. degree-seekers in New Zealand were undergraduates. The largest numbers of students studied in the humanities and social sciences (over 45 percent), but substantial numbers pursued the natural sciences, business, and other disciplines. While there is relatively little research on U.S. degree-seekers abroad, cost is likely the top push factor. U.S. higher education is among the most expensive in the world, making an increasing number of U.S. students to seek lower-cost options abroad. Some research also indicates that the experiential aspects of studying abroad, such as immersion in another culture and traveling opportunities, are important to many American students as well. As stated previously, there are considerably more U.S. students going abroad on short-term educational exchanges for credit at their U.S. universities in study abroad programs. According to the IIE’s Open Doors Report, in 2015/16, there were 325,339 American students studying abroad on a short-term basis, usually no longer than a full academic year. That number was up 3 percent from the previous academic year and has more than doubled since 2000/01. As with degree-seekers, the UK has been and continues to be the top destination for U.S. study abroad students, with 39,140 students in 2015/16. In general, Western European countries continue to dominate, with Italy, Spain, France, and Germany being the other top destinations. However, non-European destinations, most notably China, Australia, Costa Rica, and Japan have also become more popular. Changes in particular destination countries, particularly regarding safety (real or perceived) can affect the popularity of the country. Mexico, for example, was also once a major destination but became less popular in recent years because of perceptions related to violent drug-related crime. Numbers are now rebounding somewhat. More U.S. students study abroad for short-term visits, a semester or less, than in longer programs. In 2015/16, only 2.3 percent of U.S. students studied abroad for a full academic year, and only one-tenth of a percent did for a full calendar year. The largest segment of students, 38 percent, went for a summer term, of which the majority went for only two to eight weeks. Nearly 32 percent of students went for one semester. Short-term study tours, often just a few weeks in duration and usually led by home institution faculty, have become increasingly popular. In terms of fields of study, the largest segment of U.S. short-term students abroad is in STEM (science, technology, engineering, and mathematics) fields (25 percent in 2015/16). This segment has grown steadily over time, from about 16 percent in 2005/06. The next largest segments are students in business and the social sciences. The vast majority of students studying abroad are enrolled at the undergraduate level (86.4 percent). In terms of racial and ethnic background, white students dominate, at 76.4 percent of the total in 2015/16. In 2014, 74 percent of U.S. students abroad were white, even though they made up only 58 percent of the total U.S. higher education enrollment. There have been many calls to increase the racial and ethnic diversity of U.S. students studying overseas. Women have represented the majority of Americans studying abroad for some time now, accounting for 66.5 percent of such students in 2015/16. Mirroring trends at the higher education level, there has been a steady increase of students coming to study in the U.S. for secondary-level study, mainly in high schools. According to a 2017 report from IIE, there were 73,019 international secondary school students in the U.S. in 2013. That number rose to 81,981 in the fall of 2016. Despite the upward trend, the ratio of international students to total secondary school students in the U.S. remains modest. Similar to their higher education counterparts, high school students can come to the U.S. on an F-1, M-1, or J-1 visa and may only attend an SEVP-certified school. F-1 visa students can attend a U.S. public high school, 9th through 12th grades only, for no more than 12 months and must pay out-of-pocket for the full cost of education. If they attend private schools, F-1 students may stay longer than 12 months and earn a high school diploma. They pay the tuition fees set by the school. Students coming on short-term exchanges through a sponsoring program come on J-1 visas. F-1 visa students outnumber J-1 students (59,392 F-1 students versus 22,589 J-1 students in 2016). According to the IIE report, the majority of F-1 students come from Asia, with most coming to seek U.S. high school diplomas. Seventy-eight percent of F-1 students in 2016 were from Asia. China, South Korea, and Vietnam are the top sending countries, with Mexico, Japan, and Canada rounding out the top six. In particular, parents from these countries often want to send their children to receive a U.S. high school diploma in order to more seamlessly transition into U.S. higher education. Private high schools take in the vast majority of F-1 students (roughly 94 percent annually from 2013 to 2016). By contrast, the majority of J-1 students, 67 percent in 2016, come from Europe. These students are more likely interested in the experience of educational and cultural exchange, rather than gaining access to U.S. universities and colleges. Very little is known about U.S. high school–age students who are studying outside of the country, whether for short-term exchange or high school equivalent diplomas. No organization tracks this type of data on a national scale. Some exchange organizations track and report data on U.S. students who participate in their programs, though this does is far from a complete picture. One umbrella organization, the Council on Standards for International Educational Travel (CSIET), reports data from its member organizations. For the 2016/17 academic year, they report that 856 U.S. high school students went abroad on exchanges. This is down from years past, from a high of 2,282 U.S. students in 2006/07. No data are available on where students go. Transnational education (TNE) has grown tremendously worldwide in recent years, and the U.S. has been an important contributor to this trend. TNE generally involves students staying home or going to a third country and receiving a degree from another country through an international branch campus (IBC) of a university, or through any of a wide variety of joint- and dual-degree programs and other cross-border activities. The U.S. supplies one of the largest numbers of IBCs worldwide, along with Australia and the UK. An article from NAFSA notes that, as of April 2017, there were 78 U.S. IBCs out of a total of 249 globally. While U.S. IBCs are all over the world, there are large IBC clusters known collectively as education hubs at which U.S. colleges and those of other countries are represented. Some of the most prominent hubs are in the Gulf States of the Middle East, notably Doha, Qatar; Dubai; the United Arab Emirates; and Bahrain. The Qatari government has funded multiple U.S. universities—Cornell, Carnegie Mellon, Georgetown, Texas A&M, and Virginia Commonwealth—to open IBCs in its hub in Doha, known as Education City. Asian countries, notably China, Malaysia, Singapore, and South Korea, also host a large number of IBCs, including U.S. campuses. The federal governmental system of the U.S., along with a historical distrust of a strong central government, has resulted in the nation’s highly decentralized education system. The country’s long-standing belief in free market capitalism and unfettered private competition, as well as limited government intervention has also shaped the education system. The United States Constitution makes no explicit mention of education, but the 10th Amendment to the Constitution states that all powers not specifically delegated to the federal government are delegated to state governments. As a result, the 50 states, as well as the District of Columbia and the territories, are directly in charge of their own education systems, resulting in tremendous diversity of education nationwide. While the federal government is not directly in charge of education at any level nationwide, it does play a role in a variety of ways. The person most directly responsible for education policy at the federal level is the Secretary of Education, who is in charge of the Department of Education. The Secretary and Department of Education are part of the executive branch of government and thus answer directly to the President of the United States. The Secretary of Education is appointed by the President and confirmed by the U.S. Senate (one of the two houses of Congress). Institute for Education Sciences (IES): Provides data collection and education research on behalf of the Education Department and the federal government. Among its branches is the National Center for Education Statistics (NCES), which collects statistical information on U.S. education at all levels. Additionally, and perhaps most importantly, the Education Department runs the enormous Federal Student Aid program, which provides low-interest loans and grants to students across the country who are pursuing higher education. The president and his or her immediate advisors and cabinet (which includes the Secretary of Education)—often metonymically referred to as the White House (for the building that serves as the president’s residence and office); or “the administration”—can shape federal education policy and direct the Secretary and Department of Education to carry out his or her vision. Many of the federal agencies under the White House have various responsibilities, both direct and indirect, in regard to education. In many cases, this involvement is related to funding specific programs related to their agency mandates. For example, the National Science Foundation (NSF) funds numerous research projects at numerous universities, colleges, and research institutes across the country. They also fund many science-related education programs in elementary and secondary schools. Congress is the lawmaking body of the U.S. government and is composed of two houses: the House of Representatives and the Senate. Congress has the ability to pass legislation related to education. Finally, the federal courts, with the U.S. Supreme Court as the final arbiter among all courts, can “[settle] public policy debates that are directly and indirectly related to education.” The courts have provided policy guidance and settled important issues on a variety of issues. In most states, a state board of education is in charge of educational policymaking, usually at the discretion of the state legislature. Members of the state board of education are either elected or appointed by the governor or legislature. The state department of education typically implements all education-related policies within the state. The leader of the department may be called “superintendent, commissioner, director or secretary of education,” according to the Education Department. The top administrator may be elected or appointed by the governor or state board of education. Education is one of the largest budget items among all states and territories. Each state in the U.S. is divided into smaller administrative units known as counties (singular: county), with the exception of the state of Louisiana, in which they are called parishes (singular: parish). The other type of local government is municipal government, that of individual cities and towns. Counties usually include both multiple municipalities and more rural areas in which the county provides all local services. Elementary and secondary (K-12) education at the local level is provided by school districts, which run all public schools within their jurisdictions. There are nearly 14,000 school districts in the U.S., as of the 2014/15 school year. Each state creates the boundaries for its school districts differently. In many cases, they fall within the geographic boundaries of counties and municipalities. Local school districts are generally responsible for carrying out state education policy at a local level. They are often granted a good deal of autonomy in terms of budgeting and teaching of the curriculum, and they are responsible for hiring and supervising teachers and for raising funding, usually through local property taxes. Many school districts delegate responsibilities to individual schools as well. Typically, a local school board, usually composed of elected members (but sometimes they are appointed by other local officials), governs and makes policies for the school district. The executive head of the school district, in charge of day-to-day operations, is usually called the superintendent and is usually appointed by the local school board. In some cases, there may also be a superintendent at the county level in charge of overseeing all school districts within the county. The head of each individual school at the K-12 level is known as a principal, though the name of this position may vary some among private schools. The school year usually runs from mid-August to mid-September to anywhere from mid-May to mid-June at schools and higher education institutions alike. There is typically a one- to three-week break that encompasses the Christmas (December 25) and New Year holidays, usually called winter break. There is usually also a one-week break sometime during the spring, often (but not always) the week before the Easter holiday in March or April, called spring break. Higher education institutions use different models to sequence their programs. The semester system divides the academic year into two halves known as semesters, which are usually 15 or 16 weeks long. There is a fall semester that runs from the start of the school year to winter break, and the spring semester begins after winter break and runs until the end of the school year. Most institutions offer an optional summer semester, which may be shorter and more intensive than the fall or spring semester. The quarter system, on the other hand, divides the academic year into three divisions known as quarters, typically 10 weeks long, with the fourth quarter often an optional summer quarter. Winter break is usually between fall and winter quarters, and spring break is between winter and spring quarters. Elementary and secondary education in the U.S. are often collectively referred to as K-12 education, a kind of shorthand that refers to the grades through which students progress. The “K” refers to kindergarten, typically housed in the elementary school system. Thus, K-12 education is 12 years long for most students, plus kindergarten. As part of K-12 education, an elementary school typically enrolls students from kindergarten or sometimes first grade through the fifth or sixth grades. Students then move on to a lower secondary school known usually either as a middle school or a junior high school. The last four or sometimes three years of school are usually known as high school, or sometimes senior high school. For example, in some states, elementary schools enroll students from kindergarten to fifth grade, after which students will spend sixth through eighth grades in middle school and then ninth through 12th grades in (senior) high school. In other cases, students go to middle school for just the seventh and eighth grades, with the years before spent in elementary school and the years after in (senior) high school. In some cases, particularly in smaller, rural schools, students may go to the same school from kindergarten through 12th grade, or in some other combination. K-12 education is virtually universal. All students are guaranteed a free public education through the 12th grade. In 2014, there were more than 50 million children enrolled in public K-12 education. According to UNESCO’s Institute of Statistics (UIS), this translates into a net enrollment ratio (NER) of 93.7, meaning that roughly 93.7 percent of elementary and secondary age children were enrolled in the age-appropriate level of school. Most students in the K-12 system study at public schools – only about 10 percent of students were enrolled in private schools in 2015/16, most of them at sectarian or parochial institutions (schools affiliated with a faith tradition, such as Catholic schools, Baptist schools, Lutheran schools etc.). The minimum compulsory school age varies by state and ranges from age 5 to age 7, though children generally enter kindergarten at age 5. The main reason for the differences in mandatory starting age has to do with different state regulations. According to the Education Commission of the States, which maintains a database of various state education policies, 15 states plus the District of Columbia require students to attend kindergarten. The remaining 35 states do not. Five states do not require their school districts to make kindergarten available to students as either half- or full-day kindergarten: Alaska, Idaho, New Jersey, New York, and Pennsylvania. The rest require that either be made available. The maximum mandatory age of education also varies per state, usually from 16 to 18 years of age, or in some cases, students can drop out earlier if a certain grade level is completed. Most states mandate the offering of free public education to students until they reach a certain age (if not complete), with most ranging from ages 19 to 22. Admission into public schools is usually automatic based on residency. While private schools and some so-called magnet schools for gifted students (see below) may have additional admission requirements, there are generally no admissions tests at public secondary schools. High-demand schools may assign seats by lottery. English is the main language of instruction in virtually all schools, with the exception of some territories, notably Puerto Rico, where Spanish predominates. State policies also vary regarding instruction in other languages, generally to English language learners (ELLs) who are recent immigrants. Elementary schools typically teach students from kindergarten through either grade five or six. (As mentioned, students will begin anywhere from age 5 to 7, depending on differences in state policies, particularly regarding whether kindergarten is compulsory or even offered). Kindergarten is traditionally structured as an early childhood education program, a “pre-primary” program, but it is often housed in elementary schools. Public kindergarten is free. Some kindergartens, however, are stand-alone programs, and there are a number of other institutions that provide different forms of preschool education, including day care centers and nursery schools. Pupils can enroll in some preschool programs at the age of 3, but typically they start kindergarten at age 5. Programs can be either a full day or a half day. Kindergarten is a concept originally developed in Germany—the term is German for “garden of children”—that was brought to the U.S. in the 19th century. Traditionally, kindergarten programs were meant to be developmental rather than academic, emphasizing learning through play (following the model of education theorists such as Maria Montessori), with some early citizenship education (following the model of John Dewey). However, starting in the latter half of the 20th century, kindergarten became more academic and incorporated more set curriculum and instruction, as parents wished for their children to acquire academic skills earlier than the first grade, when academic instruction was traditionally introduced. Today, kindergarten curriculum often focuses on very basic reading and numeric skills and other areas such as basic science, art, and music. Beginning with the first grade, all students receive full-time academic instruction. Usually, elementary school students receive instruction in their core subjects from the same teacher for the entire year, but may be instructed by specialist teachers in subjects such as art, music, physical education (PE), and computer science. States determine the curriculum, and districts, schools, and individual teachers decide how to implement it. Typical core subjects are language arts (reading, writing, grammar, and spelling in English), mathematics, science, and social studies (geography, state history, U.S. history, world history). Students may also receive instruction from their regular teacher or specialist teachers in art, music, drama, PE, computer science, and other subjects. They often also visit the library on a weekly basis. Typically, middle school or junior high school (lower secondary education) encompasses sixth through eighth grades, seventh and eighth grades, or occasionally seventh through ninth grades. Sixth grade usually starts around age 11. High schools mostly run from 9th grade to 12th grade. Some such schools run 10th grade to 12th grade. Ninth grade usually starts around age 14, and students usually graduate around age 18. In some cases, middle school and high school are combined into one school, running from sixth or seventh grade until 12th grade. Just as with elementary education, states determine the general core curriculum and high school graduation requirements. School districts, schools, and teachers then decide on implementation. Either the state or the school district selects the textbooks. In many parts of the country, foreign language learning, including American Sign Language (ASL) does not start until high school. By far, the most common foreign language to study is Spanish, with almost 70 percent of K-12 students learning this language. French, German, Chinese, and Latin are the next most common. Chinese, in particular, is rising in popularity. During middle school and high school, students can often select one or several electives per year. The types of electives offered vary widely. Some electives may be specialized offerings related to core subjects, particularly at the high school level. For example, in lieu of or in addition to a standard English class, students may be able to take a course in American literature, British literature, or women’s literature. Other electives may focus on student interests and abilities, such as visual art, music, drama, debate or the school newspaper. Some are also meant to teach practical life skills. For example, a once common elective class, home economics teaches students how to cook, sew, and perform other household tasks, but has become less common. In many middle schools and high schools, there is a short class usually known as homeroom, typically at the very beginning of the school day. The length of homeroom varies from school to school but is usually much shorter than other classes. The purposes of homeroom can also vary, but they are usually designed to record daily school attendance, give daily announcements to students, and generally provide a place for students to receive guidance from a specific teacher. Usually, a teacher of any subject can serve as a homeroom teacher. Students may or may not be given a grade for homeroom, and it may or may not appear on transcripts or other student academic records. Extracurricular and co-curricular activities are usually offered at most middle and high schools and are often make up a large part of students’ school experiences. Extracurricular activities mostly take place outside of regular class time and do not provide credit toward graduation. Sports and theatrical productions (such as plays or musicals) are among the most common. Other extracurricular activities, such as chess, science projects, or foreign language study, may be organized by student clubs. During the college admissions process many universities and colleges look favorably at student involvement in out-of-class activities. Most high schools nationwide use a credit system to measure students’ progress toward graduation. The main credit system in use is the Carnegie credit system. A Carnegie credit, sometimes also called a unit, represents 120 hours of instruction per year. It generally also represents one hour of class time five days a week for one school year. The instruction time that goes into one Carnegie credit can be divided up in a variety of other ways. Most credits are assigned per year, with 0.5 credits for a semester-long course, but some school districts award credits on a semester basis. In practice, to earn a high school diploma in Minnesota, students must take four years of English, three years of mathematics, 3.5 years of social studies, and so forth. There are no minimum requirements in areas like foreign language, PE, technology, or other areas, but they can be taken as electives, depending on what each high school offers. To graduate, a student must have earned 21.5 credits, which equates to roughly five classes per year, if evenly spaced. In some cases, though, students will take more classes in their first three years of high school and fewer in their fourth year. In addition to completing stipulated course requirements and earning a certain number of credits, some states require students to pass a high school exit examination. For an overview of individual state requirements, or to compare requirements, visit the website of the Education Commission of the States (ECS). General track: Curriculum is designed for students to meet the minimum state graduation requirements. Vocational track: Curriculum meets the state graduation requirements and includes courses in specific vocations. Academic or college-preparatory track: Curriculum exceeds the state graduation requirements and prepares students to meet university admissions requirements, typically those of the state’s public universities, through additional coursework in certain areas such as English, mathematics, or foreign language. Advanced Placement (AP) courses, described below, may be part of this track. Some high schools also offer an honors program, which typically includes more rigorous coursework that follows the academic or college-preparatory track, for “high-achieving students.” In some high schools, honors courses are given more weight in the calculation of the overall grade point average (GPA). For example, an institution may equate an A in an honors course to a grade of 5.0, instead of 4.0, thus allowing honors students to achieve higher than a 4.0 GPA. This distinction can benefit them in the university admissions process. Advanced Placement (AP) is a formal program offered by the College Board in the U.S. at high schools nationwide (and in U.S. high schools around the world). Students take rigorous, college-level courses usually at their own high schools that count both towards high school graduation and potentially for university or college credit. At the end of the school year, students take the AP examination in the subject they studied. Students must pay for the exams. In most examinations, students are scored on a 5-point scale. A score of 5 is generally considered equivalent to a grade of A, a score of 4 is equivalent to a B, and so forth. A score of 3 is usually considered the minimum passing score. U.S. universities and colleges vary in their policies on accepting AP coursework, but many do, usually with a score of 3 or higher. Most AP courses satisfy general education requirements or sometimes foundational courses in certain fields of study. In 2017, a total of about 2.7 million students in the U.S. took a total of almost 5 million AP exams. There are 40 courses and examinations available, in areas such as the arts, English, history and social studies, math and computer science, the sciences, and world languages and cultures. All of them are listed on the College Board’s website. In 2017 the most popular courses, as denoted by the number of examinations taken, were English Language and Composition, U.S. History, English Literature and Composition, U.S. Government and Politics, Calculus, and Psychology. Pass rates are relatively low. Only 27.4 percent of students who took English Language and Composition, for example, scored higher than 3 in 2017. Some U.S. high schools offer International Baccalaureate (IB) programs of the International Baccalaureate Organization based in Switzerland. As of 2018, the IB website listed 1,814 IB schools in the United States. Students graduate with an IB diploma, which most jurisdictions in the U.S. consider equivalent to a U.S. high school diploma. Students may simultaneously also earn a U.S. high school diploma. Recognition of IB credits varies tremendously among universities and colleges, but many U.S. institutions award college-level credit for IB courses. Most special education students are schooled in regular public schools, as opposed to special institutions, and most learn in mainstream classrooms, often with classroom aids. Some see special education teachers during at least part of their day. In some cases, at the secondary level, special education for some students may be its own track. In addition to standard public schools, parents in many parts of the country have the option of enrolling their children in other types of schools. Some are public schools with specialized curricula. There are also more than 34,000 private schools nationwide. Among the stated goals of magnet schools are the ability to increase educational choice in geographical areas and to provide better educational opportunities to minority and low-income students. Many magnet schools use a lottery system to admit students to a limited number of spots. Charter schools are public schools established and run by private entities, such as nonprofit or for-profit organizations or even parent groups. According to the National Alliance of Public Charter Schools, these institutions can exercise the “freedom to design classrooms that meet their students’ needs.” Charter schools are granted the flexibility to deliver instruction in whatever way they see fit but are held accountable for improved student achievement. These schools have been somewhat controversial, and evidence that supports their effectiveness in raising student achievement relative to that of regular public schools is mixed. Homeschooling is legally recognized nationwide and regulated by the states. In the majority of cases, parents do the teaching, but sometimes a teacher or tutor is hired. There are a variety of reasons why parents choose to homeschool. Among the most common reasons are concerns about the quality, safety, or social environment of local public schools; as well as the desire to provide instruction at a pace appropriate for the student; and, often, the desire to provide a religious-based instruction. It’s difficult to determine the exact number of homeschooled students because different states require different reporting measures, however, it was estimated in 2012 that about 3.4 percent of the entire K-12 student population in the U.S. was homeschooled. The vast majority of homeschooled students were white and from middle- or upper-income households. State policies regarding homeschooling vary greatly in terms of everything from “notification of intent to homeschool” to the required qualifications of homeschool teachers, recording attendance, or student assessment. Many states allow homeschooled students to attend some public school classes or to participate in co-curricular or extracurricular activities, such as sports. An increasing number are participating in online education. To view policies by state, visit the “Homeschooling Regulations by State” page of the journalism organization ProPublica. Few states, if any, award accredited high school diplomas to homeschool graduates. However, a parent’s certifying that the student has completed the program is usually recognized as being formally equivalent to high school graduation. It might, however, be more difficult for home-schooled children without an official high school diploma to pass muster with employers, enlist in the U.S. military, or gain admission to higher education programs, even though universities increasingly accommodate homeschoolers and have set official admissions policies for them. Both Yale University and Stony Brook University, for example, list specific requirements for homeschoolers, which are usually met through standardized tests like the SAT and an in-depth evaluation of the homeschool curriculum, as well as other criteria like letters of recommendation. There are no mandatory national grading scales in the U.S. As a result, there is considerable variation between grading scales used by high schools throughout the country, even though most use a 100-point scale. One variation is listed below. However, it should be noted that many institutions also use pluses and minuses or different numerical ranges, including varying minimum passing grades. Some institutions may give weight to pluses and minuses as well. For example, an A- is usually weighted as 3.67. Additionally, as mentioned earlier, honors and AP classes may be weighted higher, for example, with an A being equivalent to a 5.0. Then, all numbers are averaged. A GPA of 4.0 indicates that the student received A grades in all classes. A cumulative GPA of 3.3 shows that the student is mostly a B+ average student. With more than 4,500 accredited degree-granting higher education institutions nationwide, the U.S. higher education system is extremely diverse. There are many different types of higher education institutions (HEIs) in the country. There are no nationally standardized definitions of “university” or “college,” and the name of an institution alone may not indicate exactly what type of institution it is. That said, a university, at minimum, offers bachelor’s programs and at least some master’s programs. Colleges, on the other hand, can vary quite a bit. Community and junior colleges mostly focus on associate degrees (described later), while baccalaureate colleges award bachelor’s degrees. However, institutions with the title “college” may also be university-level institutions that offer graduate programs. For example, Boston College is a full-fledged research university awarding doctoral degrees. It has retained its name most likely because of its prominent neighboring institution, Boston University. In addition, there are various big, multi-disciplinary state universities and a large number of private universities that offer master’s and doctoral programs. There are also mono-disciplinary, special focus institutions that offer programs in professional, vocational, and arts fields at different levels of education. By international standards, the number of private institutions in the U.S. is high. In 2015, only 35 percent of accredited degree-granting institutions were public, whereas private nonprofit and private for-profit institutions accounted for 37 percent and 28 percent, respectively of all institutions. Two-year colleges make up the largest group of institutions in the U.S., accounting for 1,113 institutions and 32 percent of all enrollments in the fall of 2014. Community Colleges (or junior colleges) play an important role in the U.S. education system and have greatly expanded access to education since their inception at the beginning of the 20th century. Hailed as “people’s colleges,” community colleges were initially designed to provide a low-cost, publicly-funded higher education alternative for broader segments of society while simultaneously freeing up traditional universities from providing general education, allowing them to concentrate more on advanced study and research. While this clear-cut distinction never fully materialized, two-year community colleges certainly have proven to be a highly successful model and today enroll a large portion of U.S. students. According to the American Association of Community Colleges, there were 1,103 community colleges in the U.S. in 2016 (980 public institutions, 35 tribal institutions and 88 independent colleges). These institutions enrolled 7.1 million students in formal credit-bearing programs and another five million in non-credit bearing programs (continuing education, certificate programs, etc.). Over time, many community colleges began to adopt more vocationally oriented programs beyond general programs in liberal arts and sciences. In recent years, the number of applied, career-oriented programs offered by two-year institutions in fields like allied health has been growing strongly, partly because of changes in labor demand. While many vocational programs conclude with formal degrees like associate of applied sciences degrees, the number of sub-degree vocational credentials awarded by public community colleges is also growing and has increased by 109 percent between 2002 and 2012 alone. Community colleges are usually open admission or open access—applicants need only have a high school diploma or its equivalent to be admitted—and charge, on average, much less tuition than universities. This makes them an important vehicle for educational and social mobility for lower-income groups, minorities, and immigrant populations. Community colleges are also a popular option for older adults who want to upgrade their education and skills. One way to determine the type and status of an institution is to use the Carnegie Classification of Institutions of Higher Education, often just called the Carnegie Classification System. The system uses multiple levels of classification, but one of the most commonly used is the Basic Classification, most recently updated in 2015 and which is listed in the table below. 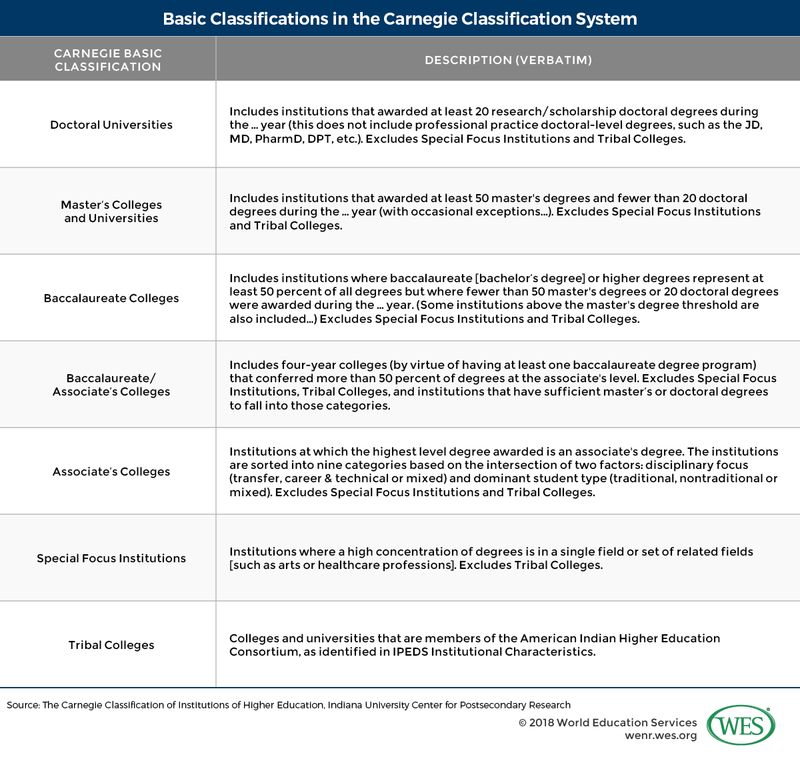 The classification of individual institutions can be looked up via the Carnegie Classification website or IPEDS (Integrated Postsecondary Education Data System). The Ivy League was formed as an athletic association in the 1950s. The term Ivy League was first used when these eight institutions were among the first to be part of the NCAA (National Collegiate Athletics Association) Division I in major sports such as basketball and (American) football. To this day, the Ivy League remains an athletic association, a smaller group within a larger group of NCAA Division I schools. The name Ivy League, however, signifies meaning that goes far beyond athletics. The name has become synonymous with prestige and privilege as well as strong academics. These universities have groomed many U.S. presidents and other major U.S. and world leaders, as well as leading intellectuals, artists, and Nobel laureates, among others. And there is little doubt that they are top universities, some of the best ranked in the world. However, the Ivy League has received plenty of criticism. For one, this elite group does not include some other top universities in the country, including private universities outside of the Northeast or any public universities. In international rankings, some other universities such as Stanford University and the Massachusetts Institute of Technology (MIT) and public universities such as the University of California, Berkeley, rank as high as most of the top Ivy League institutions, and well above a few of them. This has led to other, more informal groupings (which are not always agreed-upon), such as the “Public Ivies,” a list of top U.S. public universities such as the University of California, Los Angeles (UCLA) and the College of William and Mary in Virginia. And there are also more fundamental criticisms concerning the perpetuation of elitism and privilege. One of the fastest-growing segments of U.S. higher education in recent years has been for-profit education. Private for-profit institutions, sometimes known as proprietary schools, generate revenue for their owners or shareholders; they span a wide range of institutions, from career colleges and trade schools to accredited universities awarding master’s and doctoral degrees. Some for-profit institutions are large, nationwide institutions run by publicly traded corporations, while others are small and privately owned. They include some of the largest and smallest post-secondary institutions in the country. The University of Phoenix, headquartered in Phoenix, Arizona, is one of the largest institutions in the country in general, as well as among for-profit institutions. It has more than 60 campuses spread over 21 states, as well as the District of Columbia and Puerto Rico. Proprietary institutions are known for attracting significant numbers of low-income, minority, and first-generation college students, many of whom are considered to be unprepared for college-level study. Many institutions are open access. A majority of the revenues of for-profit institutions indirectly derives from federal student aid, largely through loans taken out by students, as well as some federal and state grants. This trend of low-income, underprepared students taking out large loans for an often expensive education has made these institutions vulnerable to criticism and increased scrutiny by the federal government. For-profit dropout rates are high, as is the number of students attending these schools that default on their federal student loans. Additionally, there are questions regarding how well these institutions prepare students for good-paying careers. The administration of Democratic President Barack Obama was skeptical of for-profit institutions and sought to regulate them more to curb abuses. Republican administrations, on the other hand, are usually more amenable to for-profit institutions, since Republicans are more likely to believe in market-based approaches to education. The administrations of Republican Presidents Ronald Reagan and George W. Bush were generally positive toward for-profit education. Republican President Donald Trump and his Secretary of Education, Betsy DeVos, are both generally in favor of the privatization of education, including for-profit post-secondary education. As with K-12 education, states are in charge of overseeing all post-secondary education within their jurisdictions. States usually set the general framework for higher education within the state, particularly in regard to public institutions, and license or charter institutions to operate. However, universities and colleges have, in general, a high degree of autonomy and self-governance. Various models of governance in higher education have emerged over time. In some states, major public universities such as the University of Michigan function with almost full autonomy. Others are more subject to supervision from the state government. Virtually all post-secondary institutions, public and private, have a board of trustees or board of regents who govern the institution. For public institutions, this board is usually appointed by the governor or state legislature, though in some states, they are popularly elected. At private institutions, board members are appointed by the governing board. Community colleges are more likely to be locally run, featuring a board of local members that is either appointed or elected. Most institutions have a chief executive typically called the president or sometimes chancellor who is in charge of running the institution. This individual is usually hired by the board. The board usually assigns the day-to-day operations of the institution to the president, who usually hires other senior administrators. In some states, particularly those that are larger, public universities may be part of a university system. This usually produces another layer of governance between the state government and the individual institution. The university system typically has a board appointed by the state authorities and a chancellor in charge of running the system. As the American Council on Education (ACE) notes, system officials “oversee campus budgets, set policies such as admissions standards, coordinate degree programs, and facilitate credit transfer and articulation between the state’s public colleges and universities.” They also represent their interests to the state and sometimes federal government. Still, even within a university system, universities still have a considerable degree of autonomy. Funding of U.S. higher education institutions is highly complex, and many institutions make use of a variety of sources of revenue. However, there are some key differences between public and private institutions. Additionally, there is one major trend that has emerged over the last several decades among all types of institutions, but particularly public universities: the growing dependence on student tuition dollars as a source of revenue. Public institutions, which are under the authority of the states, have traditionally received most of their funding from state governments. However, starting in the 1990s, as many states faced budgetary problems, most have increasingly shifted state funds away from public institutions, leaving student tuition dollars to make up the difference. This disinvestment in state institutions has sparked a debate about how much government should fund higher education versus students and their families. The percentage of government spending allocated to tertiary education is currently among the lowest levels among OECD member countries. Private institutions, which receive little or no direct government funding, have long relied on student tuition and fees for revenue. Nonprofit private institutions, relative to public institutions, have tended to enroll students from higher income households. For-profit institutions often enroll lower income students who rely heavily on federal student aid. (For a discussion of for-profit education see the section For-Profit Institutions.) However, many institutions, particularly private nonprofits, increasingly offer “tuition discounting,” a common term for institutional financial aid, to students who cannot or who are unwilling to pay the full price of tuition. Both public and private (particularly nonprofit) institutions have developed various other forms of revenue aside from student fees (and, by extension, federal and state student aid) and state appropriations (for public institutions). Other common sources of revenue are private gifts (often from alumni), investments and holdings, and research grants from government, nonprofit, and industry sources. One area of tremendous discussion in terms of revenue streams is endowments, which are non-taxable financial gifts from private sources to universities “meant to be invested to grow the principal and provide additional income for future investing and expenditures.” They can allow an institution to have a steady source of funding for years. Endowments have made some of the most prestigious universities in the U.S., such as Harvard, Yale, and Stanford, incredibly wealthy (and thus open to criticism). Harvard University’s endowment value in 2017, for example, was $36 billion, according to Money magazine. States are responsible for authorizing universities and colleges to operate within their jurisdictions. Accreditation, however, is a voluntary process for institutions. Unlike in other countries, where accreditation is often provided by governments or state-authorized organizations, accreditation bodies in the U.S. are private nonprofit organizations. The process is peer-driven and meant to provide some quality assurance across the extremely varied higher education system in the United States. Additionally, building trust in higher education institutions among employers, and among institutions themselves for the purpose of admitting students and transferring credits, are among other important public benefits, as detailed by Judith Eaton, president of the Council of Higher Education Accreditation (CHEA). Perhaps one of the most important reasons for seeking accreditation, from the institutions’ viewpoint, is that it is required to be eligible for student aid at the federal level and usually also at the state level. Accreditation is mandatory for federal student aid under Title IV of the Higher Education Act. The two main entities overseeing accreditation organizations are the Department of Education and CHEA, a non-governmental body representing more than 3,000 member institutions. To be recognized, accreditation agencies must meet certain standards and criteria that the Education Department and CHEA have issued. There are three types of accrediting agencies: regional, national, and specialized programmatic agencies. All are member-based and largely funded through member dues. National accreditation agencies also accredit entire institutions and either focus on faith-based institutions (which accredit a modest number of institutions in total), or career-focused institutions (which accredit a substantially larger number of institutions). Self-study: The institution under review must analyze its own performance and prepare a report. Peer review: Faculty and staff from peer institutions review the self-study report. Site visit: A team of volunteers from the accreditation agency, usually from peer institutions, visits the institution to check performance against the self-study. Decision issued by the agency: A commission within the agency, usually made up of individuals from peer institutions and sometimes members of the public, review all evidence before making a decision. For a list of all accreditation agencies and their recognition status by both the Department of Education and CHEA, see the CHEA directory. While international university rankings are often an unreliable and heavily criticized proxy for measuring the quality of academic institutions, it should be noted that U.S. universities have dominated global rankings since their inception and continue to do so today, although other countries like China are increasingly rising in the rankings. In the current 2018 Times Higher Education World University Rankings, for instance, fully 41 of the 100 top-ranked universities are U.S. institutions. The four highest ranking U.S. institutions are the California Institute of Technology and Stanford University (both ranked third after Britain’s University of Oxford and University of Cambridge), MIT (fifth), and Harvard University (ranked sixth). The picture in other rankings looks similar. In the current 2018 QS World University Rankings, 32 U.S. institutions are among the top 100 with MIT, Stanford, and Harvard ranked as the top three institutions worldwide. In the most recent Shanghai Ranking (ARWU), 48 U.S. institutions are included among the top 100, with Stanford and Harvard ranked as the best universities in the world. There are also several domestic university rankings in the U.S., one of which is the National University Ranking by U.S. News & World Report. Such rankings are often an important consideration for students when choosing schools to apply to, but like international rankings, the national university rankings have been criticized by many. Critics point to the arbitrary nature of the rankings (is an institution ranked at position 10 really better than an institution ranked at position 15?) They also lament the use of soft measurements like “peer assessments” as ranking criteria; and the fact that universities seek to “game” the ranking systems in order to attain a higher ranking. Until the mid-20th century, higher education in the U.S. was largely the domain of the elite, particularly white men. However, following the Second World War (1939–1945) and the Korean War, large numbers of troops returning from the wars were funded by the federal government through the GI Bill of Rights, which was designed to reintegrate them into the U.S. labor force. The GI Bill started the “massification” of U.S. higher education—making it available to the masses—sharply increasing enrollments and the numbers of institutions. The percentage of total high school graduates who enrolled in higher education increased from 45 percent in 1960 to nearly 70 percent in 2016. Additionally, the civil rights movements of African Americans and other minorities, along with the women’s rights movement, led to increased diversity in higher education, with more women and members of racial and ethnic minority groups attending. For example, the percentage of African-American high school graduates who went on to higher education went from 45 percent in 1972 (the first recorded year for this group) to 57 percent in 2016. Today, women comprise more than 56 percent of higher education enrollment nationwide. In the fall of 2015, there were more than 20 million students enrolled in U.S. institutions of higher education, according to the 2016 Digest of Education Statistics. The vast majority were enrolled in degree-granting programs, 73 percent at public institutions. During that same year, 4.5 million degrees were awarded. Since about 2011, however, enrollment in U.S. higher education has declined slightly and is projected to largely remain flat through at least 2027. In 2011, enrollment hit a peak of over 21 million, but then declined to under 20 million in 2016. The Digest of Education Statistics forecasts the numbers to remain around 20 million for at least a decade. Among the reasons cited for the decrease in enrollments are declining birth rates, lower numbers of high school graduates, rising tuition fees and increases in employment rates after the Great Recession of 2007–2009. To measure student progress toward graduation: To graduate, students must accumulate a certain number of credits. In bachelor’s degree programs, for example, students typically need to earn at least 120 semester credits or 180 quarter credits. To determine the enrollment status of students. Students must be enrolled in courses equivalent to a certain number of credits to be considered a full-time student. This threshold is typically 12 credits per semester at the undergraduate level. Students enrolled in fewer classes than that threshold are classified as part time. To determine pricing of tuition and additional fees. Many institutions charge tuition per credit, or they provide cost estimates to students on a per credit basis. HEIs using the quarter system have a slightly different credit allocation method. Because of the shorter terms, credit hours in these systems represent less academic work than in the semester system. Five credits in the quarter system typically represent the equivalent amount of study as three credits in the semester system. A bachelor’s degree in the quarter system therefore typically requires the completion of 180 credits. Some institutions follow entirely different credit systems. (Carnegie-based systems and the study hour in general have come under scrutiny in recent years, with many advocating assessment of actual student learning in place of hours of learning.) In any case, whether an institution uses the study hour system or a different one, student transcripts from the institution will typically include an explanation of their credit system on the back side of the transcript or on an information sheet. There are two main degrees offered at the undergraduate level in the U.S.: the associate degree (students are supposed to complete in two years) and the bachelor’s degree (four years). In general, U.S. undergraduate education follows the liberal education model (sometimes also called the liberal arts model). Unlike in many other education systems worldwide, most undergraduate students have to take a sizeable amount of general education courses in addition to courses in their major field of study. This model prepares students for the workforce through in-depth study in specific fields while simultaneously emphasizing academic breadth (in having a good grasp of various fields of knowledge). The liberal education model, thus, focuses on developing students’ critical thinking, problem-solving, communication, and collaborative skills. Requirements for admission to undergraduate programs vary tremendously. Some institutions and programs, particularly community (or junior) colleges and associate degree programs operate under open admissions. For these programs, students only need to have a high school diploma or its equivalent, and perhaps meet a certain age threshold, such as 17 or 18 years of age. These schools admit most or all students who meet these basic requirements. On the other end of the spectrum, elite, highly selective universities may admit only a small number of applicants who must meet a wide range of requirements. For example, Vanderbilt University, a highly selective private institution in Nashville, Tennessee, had an acceptance rate of only 10.9 percent of first-year applicants for the fall 2017 semester. Most institutions are somewhere in between, with most HEIs requiring much more of prospective students than just a high school diploma. The student’s high school transcripts, which may include a review of the student’s coursework, grades, GPA, and class rank. Standardized test scores. Unlike many other countries, the U.S. does not have a standardized nationwide high school exit exam or university admissions exam. As a result, many institutions turn to one of several privately developed standardized exams. By far, the two most common are the SAT, developed by the College Board; and the ACT, developed by American College Testing, from which it derives its name. Some institutions may require a specific score on either exam. However, many institutions no longer require such exams, or have made them optional. Involvement in extracurricular or co-curricular activities, such as sports, music, the school newspaper, clubs, or community service. In some cases they also look for demonstration of leadership. Recommendation letters from teachers, school counselors, employers, or other adults who are not relatives. One or more essays or personal statements, usually following a specific prompt and instructions. A portfolio of the student’s best work, especially for programs in the visual arts, or an audition, to apply to music or dance programs. Most institutions require students who graduated from a secondary school in a non-English speaking country or sub-national region (such as Quebec, Canada) to submit evidence of English language proficiency. This typically requires a minimum score in a language exam, such as the TOEFL (Test of English as a Foreign Language) or IELTS (International English Language Testing System). A smaller number of institutions assess English proficiency through other means, such as an interview specifically focused on spoken English ability. In the transfer stream, students usually take most or all of their general education requirements for the successive bachelor’s program; and if students know their intended major, they can also take some foundational courses in that discipline before they transfer. Most four-year institutions will consider an associate degree as equivalent to two years of education toward the bachelor’s degree. Other universities may deem an associate degree as meeting all general education requirements, thus allowing students to focus on taking major (and minor) classes. However, to allow for a seamless transfer of credits, the two-year institution and the four-year usually need to have an articulation agreement between them. Accepting credit for a student’s prior work varies tremendously from institution to institution. Some universities may not accept credit for all the courses completed in associate programs, and instead require students to fulfill additional credit requirements at their institution. Associate of Arts degree (AA): general education courses with a focus in a specific humanities or social sciences discipline. This degree is designed for transfer into a Bachelor of Arts program. Associate of Sciences degree (AS): general education courses with a focus in math, science, technology, or a health-related field. This degree is designed for transfer into a Bachelor of Science program. Associate of Applied Sciences degree (AAS): a vocational or technical program with a focus on a specific occupation. Some AAS degree programs allow for transfer into a bachelor’s program (particularly a Bachelor of Science program), while most are considered terminal degrees. Associate of Applied Arts degree (AAA): a vocational or technical program with a focus on a specific occupation. Some AAS degree programs allow for transfer into a bachelor’s program (particularly a Bachelor of Arts program), while most are considered terminal degrees. An associate degree is typically earned after completing 60 semester credits or 90 quarter credits. Students may start a bachelor’s program at a university or four-year college directly after high school, or they may transfer in after earning an associate degree. Bachelor’s programs are usually four years long, but may be five years in length in fields like engineering. Some institutions offer accelerated programs for students to finish in less than four years. A bachelor’s degree is typically completed with at least 120 semester credits or 180 quarter credits. A cumulative minimum GPA of at least 2.0 (out of 4) is usually required for graduation. Students take general education courses (GE) and courses in their major. Some institutions also require students to choose an additional minor field of study; in others, a minor may be optional. The ratio between GE courses and major courses varies from institution to institution (and sometimes from program to program within an institution), but typically, GE courses make up about one-quarter to one-half of a student’s course load. Institutions design their GE requirements in various configurations. The two main models are a core curriculum, in which all students take the same or most of the same courses, or “an elective or distributive format,” in which students select from a range of pre-approved courses in set subject areas. Some institutions require or strongly encourage students to take all GE courses in their first two years, while some integrate GE courses with major (and minor) courses throughout the entire four-year curriculum. Many institutions, usually those that are less selective or open access, provide remedial or developmental courses to students, often in math and English. Many institutions test students’ math and English skills, or they may look at high school grades and SAT or ACT scores to determine math and English ability. Scores below a certain threshold may require students to complete remedial courses in those subjects. The courses do not count toward the student’s degree but are required for the student to advance. The courses are not free. Students may declare their major when they enroll or by the end of their second year, and they can change their major if they wish. At some institutions, most major courses are taken in the third and fourth (and sometimes fifth) year of the program, while in others, introductory major courses can be taken in the first year. For most programs, there are foundational courses that all students in the major must take. Students can then select from a broad range of courses that fulfill certain subject or thematic areas, based on students’ interests and career objectives. Some majors require or offer concentrations in a specific branch of a field of study. For example, a student studying for a bachelor of science in biology may concentrate in cellular biology, botany, or zoology. Some institutions offer cooperative (or co-op) programs, which allow students to incorporate work experience into their academic studies. These programs are usually five years long (instead of four) and include two semesters of internship or work experience. Bachelor of Arts degree (BA): usually awarded in the arts, humanities, and some social sciences. Example: Bachelor of Arts in Spanish literature. Bachelor of Science degree (BS): usually awarded in the natural sciences, mathematics, technology, engineering, medical fields, and some social or behavioral sciences. Example: Bachelor of Science in biochemistry. As in the school system, grading practices in higher education are not uniform across the country and vary by institution, even though grading practices are more standardized at the higher education level. Below is the most common grading scale HEIs use. As in secondary education, most higher education institutions calculate a GPA for students so they can measure students’ academic performance. The general minimum admission requirement for master’s degree programs is the bachelor’s degree. To be admitted to a doctoral program, students typically need to have earned a master’s degree; but some doctoral programs will accept high-achieving students who have completed only a bachelor’s, particularly in a related discipline. These students are often awarded a master’s on their way to completing the doctorate. Requirements for professional programs at the graduate level may be a bit different (see the section on Professional Education below). An interview or an audition (for a performing arts program) may also be part of the admissions process. Master’s degree programs are typically one to two years long. More people pursue master’s degrees than other graduate-level programs. While there are often required core courses, most programs allow students to customize their coursework based on their career objectives and interests. Master’s programs can be either research-oriented or practice-oriented, though most incorporate both theory and practice. Research-oriented programs usually culminate in a thesis or major research project. Practice-oriented programs may do the same, or they may require or allow students to do a culminating internship or field experience, and submit a paper that reflects on their experiences. In some programs, students may take a comprehensive exam in lieu of completing a thesis, project, or internship. Most master’s programs typically require a minimum of 30 credits (45 credits on the quarter system), but programs in business administration and other professional disciplines may require 60 credits or more, including the final paper or project. To graduate, students need a minimum GPA of 3.0 (out of 4). Most master’s degrees allow students to continue on to pursue doctoral studies, but some can be considered terminal. Master of Arts (MA) degree: usually used for disciplines in the arts, humanities, and some social sciences. Example: Master of Arts in English Literature. Master of Science (MS) degree: usually used for disciplines in the natural sciences, mathematics, technology, engineering, medical fields, and some social orbehavioral sciences. Example: Master of Science in Chemistry. However, there are numerous other possible master’s degree titles, depending on the specialization. Common ones include the Master of Business Administration (MBA); Master of Divinity (M.Div), a theology degree; Master of Education (M.Ed); Master of Fine Arts (MFA); and Master of Music (MM). Master’s-level degrees in specific professional fields are discussed below (under Professional Education). Doctoral degrees, or doctorates, are terminal degrees in academic fields or fields of professional practice. Programs usually involve at least four years of study beyond a master’s degree, or five to seven years after a bachelor’s. This section focuses on research doctorates, generally those for academic fields. For research doctorates, students generally take coursework lasting one to two years (for those who begin programs after a master’s degree), usually in the form of seminars and colloquia. Students usually must pass their course requirements with an A- average in order to proceed. Once their coursework is completed, students must pass comprehensive examinations, which can be written or oral. These are often known as qualifying exams. The passing of these exams signals formal doctoral candidacy. Students then work on original research and write a dissertation based on a proposal approved by supervising faculty. The dissertation reflects original research and is expected to contribute knowledge and theory to the field. The final step is the defense of the dissertation in front of the student’s doctoral advisor and a doctoral committee composed of other faculty members. If the committee members consider the defense satisfactory, they will formally sign the candidate’s dissertation, signifying completion of the degree. Most universities publish successful dissertations, with most now available in online databases. The most common research doctorate is the Doctor of Philosophy, or PhD. This degree can be awarded in any variety of academically oriented fields, not exclusively the field of philosophy. A PhD is usually required to be a professor or other academic position, though in some disciplines, a master’s level degree suffices, particularly if it is considered the terminal degree in the field. Some research doctorate holders go to work in research institutes, government, and private industry. Professional doctorates include entry-to-practice qualifications without research component in licensed professions, such as the Doctor of Medicine or Juris Doctor (discussed below). However, there are also more research-oriented doctorates awarded in professional disciplines, including the Doctor of Education (EdD. ), Doctor of Business Administration (DBA), Doctor of Psychology (DPsych.) and Doctor of Public Health (DPH), among others. The difference between research doctorates and professional doctorates is that research in the latter has a more applied and practice-oriented focus. Professional doctorates are therefore also referred to as “Applied Doctorates.” Research is geared toward finding solutions to practical problems and designing better practices in the field. The overall structure of both programs, however, is the same. Students enter professional doctoral programs most typically on the basis of their master’s degree. The programs usually involve the completion of doctoral level coursework, the passing of comprehensive exams and the defense of a dissertation, though some students complete a different type of research project instead of defending their dissertation. Entry-to-practice programs in licensed professions like medicine, dentistry, or law are postgraduate programs entered on the basis of a bachelor’s degree. Below we describe medicine and law as examples; programs in dentistry or veterinary medicine are structured similarly to medical programs. Formal education for medical doctors in the U.S. begins at the graduate level after students complete their bachelor’s degrees. Students can obtain a bachelor’s in a variety of fields so long as they take certain courses that help ensure their success on the MCAT (Medical College Admissions Test), usually required for admission to medical schools, and that meet prerequisites for medical schools. Such prerequisites typically include biology, chemistry, physics, and English. Some universities and colleges offer a pre-medicine (pre-med) specialization within certain undergraduate majors that is designed specifically to prepare students for admission to medical school. Medical schools tend to look at applicants holistically, including professional, volunteer, and extracurricular experiences. Admission to medical schools tends to be very competitive. The first professional degree in medicine is the Doctor of Medicine (MD) degree. In order to obtain an MD, students attend four years of medical school. Coursework includes “classroom, clinical, and community experiences,” exposing students to the breadth and depth of the field, including innovative treatments and technology. Classroom and laboratory studies include anatomy, physiology, microbiology, organic chemistry, pathology, pharmacology, and medical ethics. Later in the program, students begin clinical rotations, in which they spend several weeks at a time in different hospital and clinical settings to learn about different specialties. During the final year, students determine their areas of specialization. Graduates must pass the United States Medical Licensing Exam (USMLE), under the auspices of the Federation of State Medical Boards (FSMB) and the National Board of Medical Examiners (NBME). The exam is a three-step process; typically, steps 1 and 2 are taken while students are in medical school, and step 3 is taken during residency (described below). The results are forwarded to the individual state medical boards, which determine based on their own state requirements if the student has passed. It is these state agencies which grant medical licenses for practice. During the final year of medical school, students apply to the National Resident Matching Program (NRMP), which matches them with a residency program anywhere in the country by March of that year. Residency training provides medical school graduates with “supervised, hands-on training,” usually at a teaching hospital, and lasts anywhere from three to eight years, depending on the specialty. Individuals going through a residency program are called residents; in the first year they are typically called interns. As noted earlier, licenses are granted by the state or territory in which the graduate wishes to practice. To obtain a license, individuals generally must have completed undergraduate study, medical study, and a residency, and have passed the USMLE. For a list of state boards and their contact information, see the FSMB website. Some joint degree programs combine an MD with another graduate-level degree, usually in a shorter amount of time than it would take to pursue them separately. For example, an MD-PhD program allows a student to obtain both degrees simultaneously, obtaining a PhD in a medically focused discipline such as biochemistry or immunology. Unlike in many countries, legal education in the U.S. begins at the graduate level. Undergraduate students who wish to enter law school traditionally major in business, economics, English, history, philosophy, and political science, but can pursue any area of study they choose. The American Bar Association (ABA), however, encourages prospective law students to “develop [their] research and writing skills.” Some institutions offer a pre-law major that is generally interdisciplinary, but it is not required to be admitted to law school. Law schools generally require many of the same components as other graduate schools. The main examination usually required is the LSAT (Law School Admission Test) from the Law School Admission Council (LSAC). The test usually takes half a day to complete. Law school graduates are generally awarded the Juris Doctor or Doctor of Jurisprudence (JD) degree, a first professional degree. Most JD programs are three full-time years in length, or about 90 credits. There is no standard law school curriculum, as LSAC explains, yet offers this: “First-year curricula usually include courses in civil procedure, constitutional law, contracts, criminal law and criminal procedure, legal method, legal writing and research, property law, and torts.” After the first year, the curricula can vary substantially based on the type of law school as well as students’ specializations. . The next step after receiving a JD is to apply for admission to the bar in the state where the graduate wishes to practice. Bar admission usually involves two parts: the demonstration of competence, which is achieved through holding a JD from an American Bar Association-approved law school; and passing the state bar examination. The examination lasts two days: The first day is an item test and the second day an essay exam. Most law students take the bar exam shortly after graduation. There are many ways to become a nurse in the U.S. Some nursing occupations (such as the Certified Nursing Assistant, or CNA) only require some training after students complete high school. More advanced positions require at least a graduate level degree. The type of position dictates the type of education and training required, as shown in the table below. Like most professions, the teaching profession is regulated at the state rather than the national level, but there are some common practices. There are two types of teacher certification: traditional and alternative. Earn a bachelor’s degree in education (particularly for elementary education) or in a subject content area (for example, English, mathematics) with a focus on education, depending on the state’s requirements. This tends to be a faster method and usually works best when students know fairly early on in their postsecondary education that they want to become teachers. Earn a bachelor’s degree in another subject and then complete a post-bachelor’s program, either a certification program or a full master’s degree. This is the typical method for individuals who discover late in their undergraduate program or later that they wish to teach. Both routes are sometimes known as Teacher Preparation Programs (TPPs). Most states require that students pass an entrance examination in reading, writing, and math in order to enter a post-bachelor’s TPP, regardless of the intended subject or level of teaching. The most common of the examinations required is Praxis, developed by the Educational Testing Service (ETS). Many states impose other, specific additional requirements—either in the form of coursework (typically included in TPPs) or examinations—that future teachers must complete in order to be eligible for a teaching certificate. Once they meet all the requirements are met, future teachers can apply to the state agency for their certification in the state where they wish to teach. Student teaching is a common part of TPPs. Regulations vary by state regarding the length and type of student teaching required of prospective teachers. According to a study by the National Council on Teacher Quality (NCTQ), about half of all states require at least 10 weeks of student teaching with a “cooperating teacher,” an ill-defined term for a current teacher, either explicitly required or assumed to be experienced, under whom the student teacher works. Individual TPPs then set their own requirements and parameters for student teaching in compliance with state regulations. There are alternative routes by which individuals can be educated, trained, and certified to be teachers. One method, depending on state regulations, is to immediately start teaching and earn certification in the process. This uncommon method is usually used in schools and subjects that urgently need teachers, where teachers who have been certified via the traditional methods are in short supply. Once certified and teaching, teachers are generally required or expected to continue professional development, and many go on to eventually earn master’s degrees. After three years of teaching experience, teachers may work toward the completely optional National Board Certification (from the National Board for Professional Teaching Standards), which can help teachers advance in their careers, earn higher salaries, and more easily transfer to work in another state. TVET in the U.S. is usually referred to as Career and Technical Education (CTE). It is not standardized compared with vocational training systems in other countries. CTE is delivered in various different forms and by various different institutions. For example, there are thousands of small proprietary career colleges, most of them offering sub-degree, certificate-level programs in specific vocations. In addition, CTE is delivered by community colleges or through work-based apprenticeship programs. Private institutions constitute the majority of providers in the CTE sector (more than 75 percent of accredited CTE institutions participating in federal financial assistance programs were private in 2008). At the secondary level, CTE can be offered in specialized high school courses, or in programs at secondary-level career academies that combine career training with college preparatory curricula. At the post-secondary level, community colleges offer a multitude of applied, career-oriented two-year programs leading to degrees like the Associate of Applied Science, Associate of Applied Arts or Associate of Applied Technology, as well as sub-degree certificate programs. Four-year institutions offer some of these programs as well. Though most programs include some general education coursework, they are primarily focused on applied technical training in specific vocations and may include an internship component. In addition, there are programs that straddle secondary and post-secondary education. So-called Tech-Prep programs, for instance, combine two or more years of secondary education with two years of post-secondary education, concluding with the award of an applied associate degree as well as a high school diploma. Furthermore, apprenticeship programs provide CTE through part-time classroom instruction that augments practical training at a workplace. More than 500,000 trainees were enrolled in formal apprenticeship programs registered with the federal government in 2017. Formal apprenticeship programs last between one and six years. For doctoral degrees – Official letter or degree conferral form confirming the award of the degree – sent directly by the institution attended. For further details, see the WES Canada website. China is already the world’s largest economy when measured by purchasing power parity. See WES reports How Master’s Students Choose Institutions: Research on International Student Segmentation and Improving the International Student Experience: Implications for Recruitment and Support. See Institute of International Education (IIE), British Council, Australian Education Office (AEO), & DAAD (German Academic Exchange Association). (n.d.). Demand for Study Overseas by American Students and Employers. New York: IIE. Retrieved from https://www.iie.org/en/Research-and-Insights/Publications/Demand-for-Study-Overseas-from-American-Students-and-Employers. Council on Standards for International Educational Travel (CSIET). (2017). International Youth Exchange Statistics: 2016-2017 Academic Year. Available for order at http://www.csiet.org/site_store.cfm. USNEI. (2008). “Organization of U.S. Education: The School Level.” https://www2.ed.gov/about/offices/list/ous/international/usnei/us/edlite-org-us.html. The two outliers from this are Alabama, which only mandates public education be available until age 17, and Texas, which mandates until age 26. Christina More Muelle. (2013). “The History of Kindergarten: From Germany to the United States.” Retrieved from Florida International University (FIU) Digital Commons, http://digitalcommons.fiu.edu/sferc/2005/2005/1/. For more information on the historic purpose of homeroom classes, though very dated, see David Benson McCorkle. (1953)., Homeroom Programs in Selected Secondary Schools in the United States, (doctoral thesis, Oregon State University). Retrieved from https://ir.library.oregonstate.edu/downloads/dn39x394t. College Board. (2017). Advanced Placement Program Summary Report 2017, Retrieved from https://research.collegeboard.org/programs/ap/data/participation/ap-2017. David Deming, Claudia Goldin, and Lawrence Katz. (2013). “For-Profit Colleges.” The Future of Children: Postsecondary Education in the United States, vol. 23, no. 1, pp. 137-163. Available at https://futureofchildren.princeton.edu/sites/futureofchildren/files/media/postsecondary_education_in_the_united_states_23_01_fulljournal.pdf. For a good discussion of these criticisms, see Tressie McMillan Cottom. (2017). Lower Ed: The Troubling Rise of For-Profit Colleges in the New Economy. New York: The New Press. USNEI. (2008). “Organization of U.S. Education: Tertiary Institutions.” Retrieved from https://www2.ed.gov/about/offices/list/ous/international/usnei/us/edlite-org-us.html. USNEI. (2008). “Structure of the U.S. Education System: Associate Degrees.” Retrieved from https://www2.ed.gov/about/offices/list/ous/international/usnei/us/edlite-structure-us.html. USNEI. (2008). “Structure of the U.S. Education System: Bachelor’s Degrees.” Retrieved from https://www2.ed.gov/about/offices/list/ous/international/usnei/us/edlite-structure-us.html. USNEI. (2008). “Structure of the U.S. Education System: Master’s Degrees.” Retrieved from https://www2.ed.gov/about/offices/list/ous/international/usnei/us/edlite-structure-us.html. USNEI. (2008). “Structure of the U.S. Education System: Research Doctorate Degrees.” Retrieved from https://www2.ed.gov/about/offices/list/ous/international/usnei/us/edlite-structure-us.html.